"'No matter what he says, that's Wanderlove,' she tells me. 'That's how he lives it. Isn't that right, Rowan? The only way to escape the past is to keep moving forward.'" Wanderlove is an incredibly vivid book that makes you feel as though you're truly living the story instead of just reading it. From the breathtaking descriptions of the places Bria visits to the emotional journey she takes, this book was completely captivating. You can read my full review here. 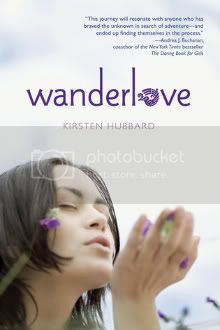 I am very excited to offer one copy of WANDERLOVE for a giveaway! This contest is open internationally as long as The Book Depository ships to your country. Must be 13 to enter. Please see my Contest Policy for more information. My most favorite book set in another country would be The Diary of Anne Frank. Does DAUGHTER OF SMOKE AND BONE count? I am not sure if I have any favorite books set in another country. Thanks for the chance to win! Looks great! I love books set in England, however my favorite book set in another country has to be Anna and the French Kiss.